In early June, my sister and I embarked on a spectacular trip: 2 weeks in Europe and the United Kingdom. After planning for months, the anticipation was at an all time high. Our itinerary was as follows: 4 nights in Rome, 2 nights in Sorrento, 4 nights in Venice, and 4 nights in London. I really don’t know how I’m going to lay out everything we ate on this trip, but I’ll do my best. We tasted, smelled and inhaled so much; many of our activities were centered around good coffee, wine, and food. 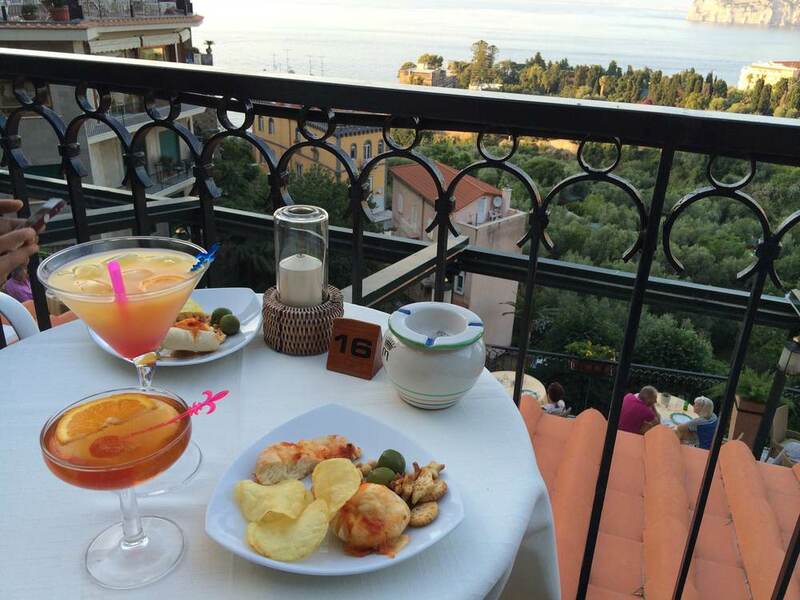 There was always time to go to the bar close to our hotel in Italy (which is a coffee shop) before we hit the sights, always time to sneak in a happy hour in the early evenings, and always time to take an extra few minutes to Yelp/TripAdvisor a good neighborhood restaurant. You could say that by the end of the trip, we were a tad bit concerned about the extra weight we were carrying around on our bodies….but no regrets. In my opinion, Giolitti has the best Gelato in all of Italy. We had gelato at two other places: Grom’s (in Venice) and San Crispino (in Rome), but Giolitti’s beat them both. I mean, just look at the gelato. Expert gelato eating tip: if you don’t eat fast enough, the panna, which is the whipped cream, will slip off and a pigeon or seagull will gleefully proceed to eat it off the street. Iced Cappuccinos are served all over Rome, even though they might not be on the menus. You may even get some weird looks if you say “iced.” Say “cold cappuccinos” if that happens. If you see “Shakerato” on the menu, get that instead. It’s a Starbucks frappuccino, done Italian style. 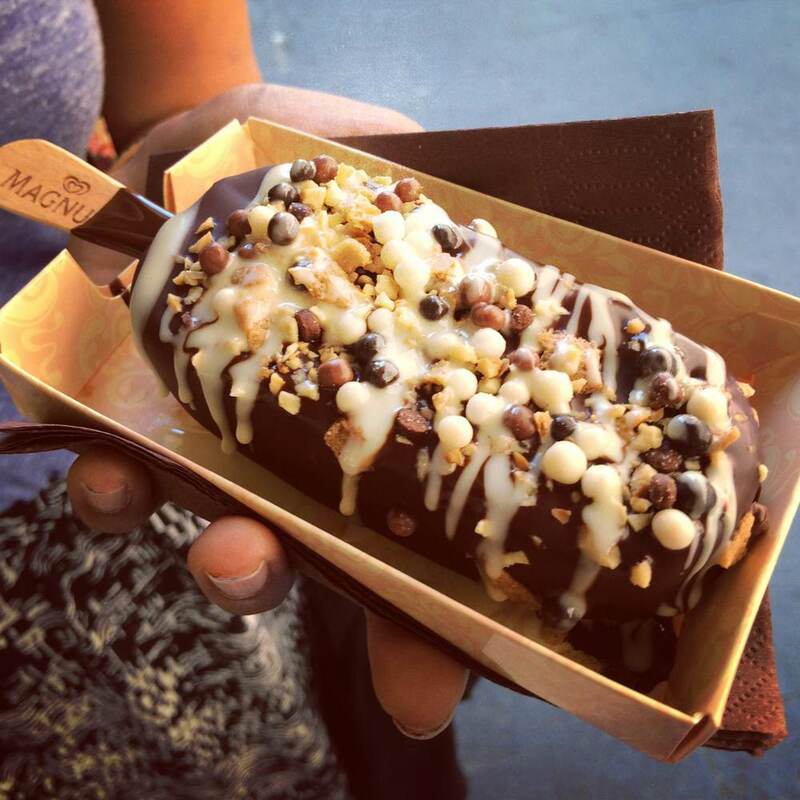 On our way back from the Vatican, we stopped at an adorable ice cream shop called Magnum, that was dipping chocolate and vanilla gelato in different kinds of melted chocolates. We hadn’t eaten lunch yet but we could not resist. #dessertfirst. We found this little gem on the way to Trastevere, a little neighborhood located across the Tiber River. Forno Campo De’Fiori serves different kinds of cookies, and pizza! This was my favorite pizza: the crust was just the right thickness and it was freshly made and sold; can see all the oils coming out from the cheese? Perfection. I can’t even count how many different kinds of cookies were at Forno Campo De’Fiori. We bought one of each and ate them in Piazza Santa Maria. An interesting way to serve bruschetta! This was eaten at a small restaurant in Trastevere, after we visited the Santa Maria Church. One of our days in Rome was spent trying different kinds of food in the neighborhood of Testaccio, where the working class of Rome resides. Here, we sampled 5 and 10 year old balsamic vinegars. Cannoli are actually a Sicilian specialty! This was eaten in the markets in Testaccio, where a woman from Sicily had opened up a bakery. These cannoli are made from her grandmother’s secret recipe. Spongy, slightly sweet, and tender, fresh mozzarella is something I could eat everyday! In the food tour, they paired it with bruschetta. The food tour ended with a huge meal (as if we weren’t bursting already) of pasta and wine. The noodle pasta was made simply with pecorino cheese, pepper, and pasta water. It was incredibly simple but so delicious! The tube pasta was coated in a rich marinara sauce. You will find these water pumps, also called nasoni, in the streets of Rome. They release fresh, cold water that is perfectly safe to drink! We did so whenever we had the chance. Hotel Campodimonte! How could we leave Sorrento for Capri after arriving? This view won us over. That very night we went to the hotel’s happy hour. This is when I fell in love with Italy’s green olives, which apparently grow in Sorrento in massive quantities. When life gives you lemons the size of melons, make lemon granita! Lemon granita was the most refreshing drink we tried in Sorrento; it’s the perfect balance of tart and sweet. Also made from the lemons in Sorrento is limoncello, lemon flavored alcohol. An absolute must-taste for lovers of lemon! Honestly, who lives here? And how lucky are they? This is the view from Ravello, which is 80 kilometers above ground! You can see Amalfi from here. By the time our last night in Sorrento came around, we were feeling pretty weary of eating pasta all the time. However, this pasta did not disappoint. We were walking down Corso Italia, which is the main street of Sorrento, and we stopped at one of the many restaurants lining the streets. The pasta in Italy is very simple; there won’t be any overwhelming sauces or a myriad of vegetables. But each plate still manages to taste phenomenal. If you’re not inclined to take a historic tour of St. Mark’s Cathedral and you visit the Piazza San Marco, then definitely take a ride up the Campanile- located right in the square. The top offers amazing views of the city. La Zucca was one of the few vegetarian friendly restaurants we could find in Venice, and it did not disappoint! This asparagus lasagne was perfectly rich and so satisfying! In my opinion, this should have been a dark chocolate mousse. It was one of the best desserts I had (after gelato) in Italy! My sister and I shared one bowl of this, but the beautiful French family next to us ordered one bowl each for their two daughters aged 4 and 6. For dinner. Since we were in the last Italian city of our trip, how could we leave without tasting tiramisu? At just 5 euros, we knew we couldn’t pass it by. The intense espresso and moist ladyfingers made every calorie consumed worth it! If you are an avid Buzzfeed reader, you know that Burano is on a list of must-see places before you die (backtrack- so are Positano and Amalfi). It was extremely hot the day we decided to venture to Burano, but definitely worth it! I can’t believe people live in a town like this. Our concierge informed us of the best gelato place in Venice: Grom’s. Of course, you have to get the cream on top every time. Tip on how to find real gelato in Italy (learned this on the food tour): if the gelato you see in the display case is in fluffy peaks and mountains, that gelato is fake because they’ve whipped in a chemical mixture. Most of the gelato in Italy is fake, unfortunately. Devote 1/2 a day at least to just wandering the streets in Venice. There’s charm and beauty hidden everywhere. As soon as we settled into our room, we were brought fresh cookies welcoming us to the hotel. Such hospitality! Our research told us that our hotel had an excellent tea service. After our long day of traveling from Venice, this was just what we needed. We picked two teas: English Earl Grey and Traditional English. We were also brought 4 scones each, of different flavores: chocolate, apricot, plan, and cheese. These were served with a side of jam, a big ball of butter, fruit, and cream. We were in heaven! The next day, after all our sightseeing, we made our way to Borough Market, which is an outdoor market with many food vendors and samples. It was a foodie’s dream come true. One of our favorite vendor’s was Fitz Mustards! Who knew so many kinds could exist? We purchased the honey mustard, which is one of the most delicious I’ve tasted! This bakery had a mouth watering spread of different kinds of savory breads. We settled on a bell pepper and cheese bread/bun. Are you beginning to see why you too should go to Borough Market for lunch if you’re in London? While at Borough market, we tasted many olive oils, cheeses, and breads. So naturally, purchasing a glass of this white sangria was necessary. Halfway through our visit to Camden Town, we were starved. It was a cold and gloomy day, so we were pretty grateful to discover Wagamama! It’s a chain Asian restaurant located all over London; we shamelessly (and I say shamelessly because there were definitely more authentic and local food vendors at Camden Town….) chowed down these warm noodle bowls. I discovered nitrogen ice cream on my birthday this past February at Smitten Ice Cream in San Francisco and was smitten (haha) by it. Of course I was very excited when I peered into a creamery by the name of Chin Chin Labs and saw they were whipping up nitrogen ice cream! Pictured above is dark chocolate ice cream with hazelnut crunch and a homemade raspberry sauce. I ate 90% of this myself. By the end of the trip, my sister and I wanted nothing but to detox and drink gallons of water. That’s the one thing we noticed: our water consumption went down significantly because there was always something better to drink. Don’t let this happen to you when you travel! I am glad to be home now, but I am more convinced that I have yet to travel so much more, see so many more people, and take in more of the world. If you have any questions at all about my trip, the places we went, or need advice, let me know in the comments below! P.S. If you’re on Instagram, search the hashtag #eurogram2k14 to see more photos from this trip! This makes me want to go to Europe NOW!! Pragya, it was spectacular! I want to go back too.